Salzburg Lakes: The "Salzburger Seenland"
When people talk about a "Salzburg Lake District", they can refer to two things: If they are foreigners, the Salzburg Lakes they mean are probably those of the Salzkammergut, one of the most attractive areas of Austria. However, only a part of the Salzkammergut belongs to Salzburg. When locals talk about a "Salzburg Lake District", they are likely to refer to the so-called Salzburger Seenland ("Salzburg Lake Land"). Geographically, Salzburg comprises of a typical ice age landscape. That means, that when the glaciers withdrew millennia ago, the left great masses of ice that created small basins and when they melted, gave rise to lakes. This is particularly striking in the gentle hills in the north of the province, in the Flachgau. This is where you find several of the "Salzburg Lakes". Note that the famous Fuschlsee is generally considered to belong to the Salzkammergut, not to the Salzburg Lake District. Interestingly, the Salzburger Seenland or Salzburg Lake District is well-known within the greater region and popular as a recreational area among locals. However, foreigners generally neglect it. The Salzburg Lake District is one of the least developed areas in terms of international tourism in all of the province. The lakes of the Seenland are suitable for sailing, windsurfing, swimming, rowing and other water sports; during the winters, at least the smaller ones usually freeze sufficiently enough to allow skating, curling and other ice-related winter sports. Nice examples for Salzburg Lakes are the Grabensee, Mattsee and Obertrumer See; note also the Wallersee, the biggest lake in the area. Once over the hill from the Wallersee, you will get beyond the border to Upper Austria, where you will find the Irrsee, the Mondsee and once again the lakes of the Salzkammergut. Smaller lakes in the Salzburg Lake District such as the Egelseen are unlikely to attract foreign attention, but if you live in Salzburg for a longer period of time and look for some hiking or off-the-beaten-track swimming, they might appeal to you. There are a few municipalities in the northern Flachgau that have joint efforts to brand themselves as a travel destination. They are generally not very touristy (with a few exceptions) and thus cheaper than many other areas near Salzburg. 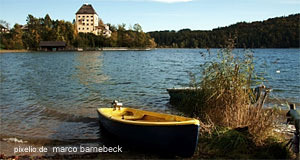 The municipalities of the Salzburger Seenland association are Berndorf bei Salzburg, Dorfbeuern, Henndorf am Wallersee, Köstendorf bei Salzburg, Lochen, Mattsee, Neumarkt am Wallersee, Obertrum am See, Perwang, Schaudorf Schleedorf, Seeham, Seekirchen am Wallersee, Straßwalchen, Bürmoos, Lamprechtshausen, Nussdorf, Oberndorf and St. Georgen bei Salzburg.